Relish recipes add spark to just about any dish. Think about it - What would a hot dog be without catsup and pickle relish? Pretty bland, right? Well, whipping up a batch of this well-known condiment at home is quick, easy, and tastes even better than what you'll find in the jar at the supermarket. You can make relish recipes out of just about any kind of vegetable, from celery to pickles and far beyond. Relish makes an excellent side dish, especially for picnics and outdoor entertaining, but it can also be used as a quick sauce for meats and fish. Once you learn the basics of making relish, try substituting ingredients and flavorings, and you'll soon come up with your own unique and yummy recipes. For example, try substituting baby carrots for cucumbers, and create a carrot relish your family will really, well, relish! 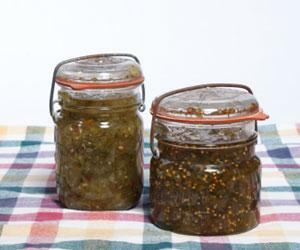 You can make a large batch of relish and store the mixture in sterilized canning jars. However, if you don't want to go to the trouble of canning, make a smaller batch, and store the results in your refrigerator. Most will keep a week in the refrigerator. Vinegar is essential in most relish recipes. Be sure to pick one that has at least 5 percent acidity. Most varieties you find in the supermarket are at least that acidic. Some herb or flavored vinegars may not be strong enough to give good results, so always check. Don't use any type of metal pan except stainless steel to heat your liquids. The vinegar will react with metals and change the color and taste of the relish. Aluminum is acceptable if you don't heat up the liquid for more than a few minutes. If you leave it in aluminum too long, it will discolor the metal. Combine the cabbage, beets and horseradish and season with salt. Scald the vinegar, dissolve the sugar in it and add it to the first mixture. Seal in clean hot jars. This is particularly good with mutton. Mix ingredients, heat gradually to the boiling-point, and cook slowly one and one-half hours. Cayenne or mustard may be added if liked more highly seasoned.